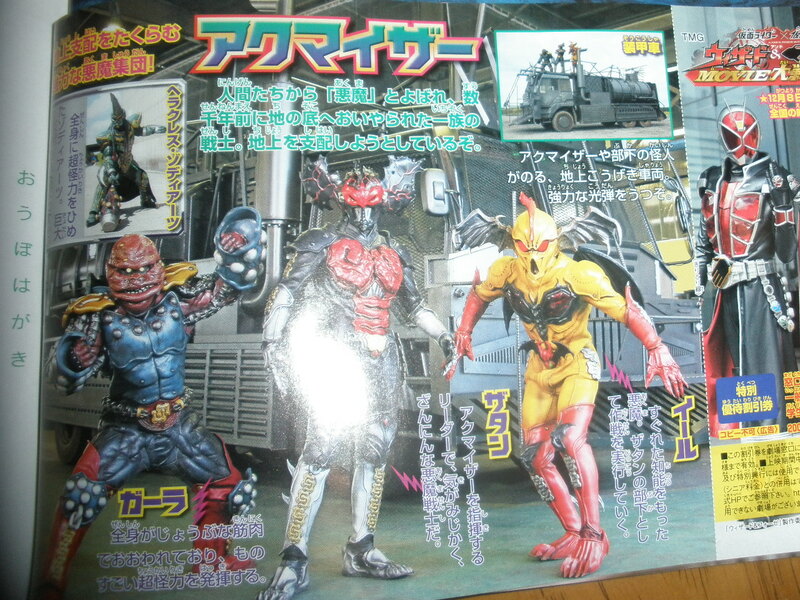 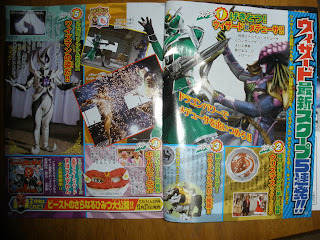 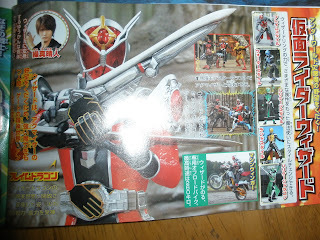 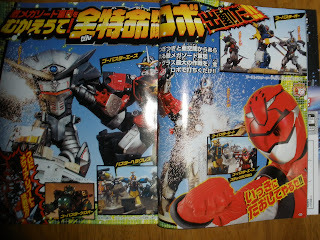 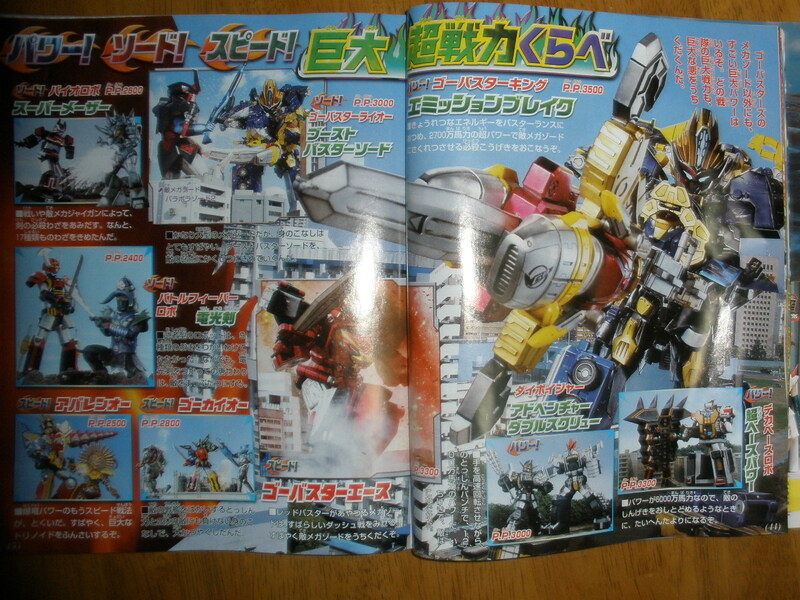 Toku Insider: New Busters and Wizard Pics! 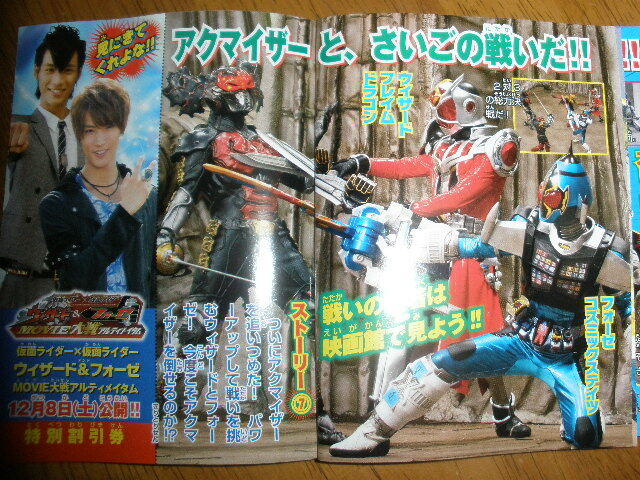 New Busters and Wizard Pics! 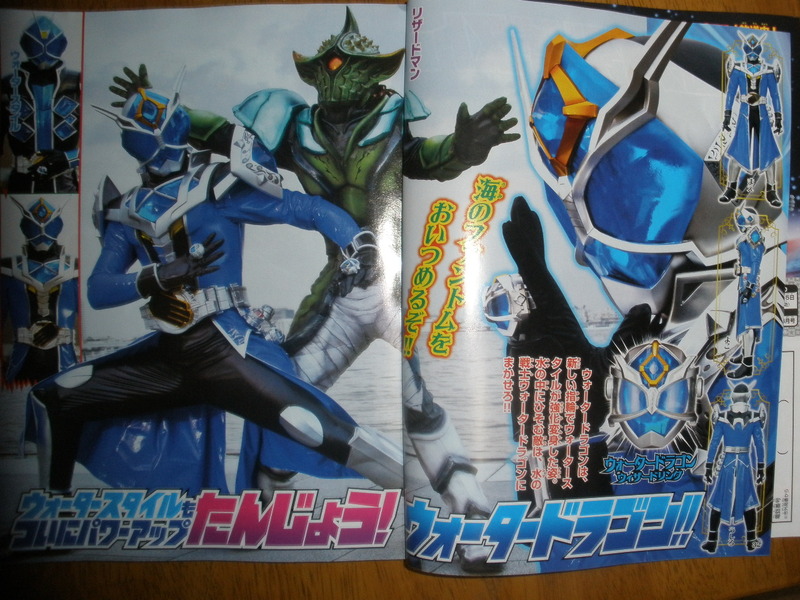 Soon, Water Style will get its' power up with Wizard Water Dragon. 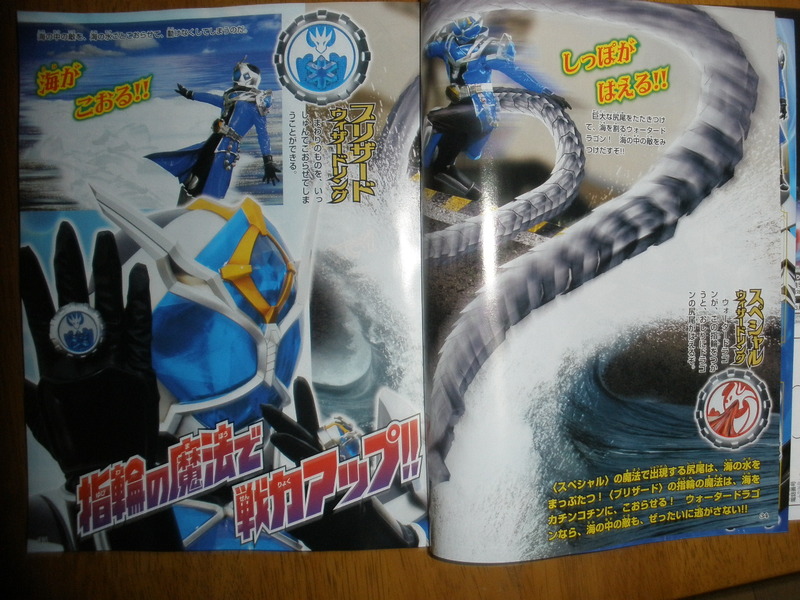 Water Dragon will be able to utilize WizardDragon's tail powers via the Special Ring, and come with a new ring, Blizzard, allowing Wizard to control snow and Ice. Big things are happening just in time for Christmas. Haruto will go toe-to-toe with Medusa, using Hurricane Dragon. He'll get 2 more rings- the Christmas Ring (holiday cheer please!) 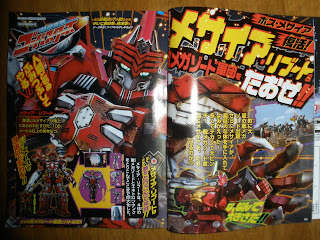 and the Cerberus Ring, which calls his newest familiar, Cerberus. There will also be a movie nod where the Donut crew bakes a donut in the shape of Poitrine's mask. 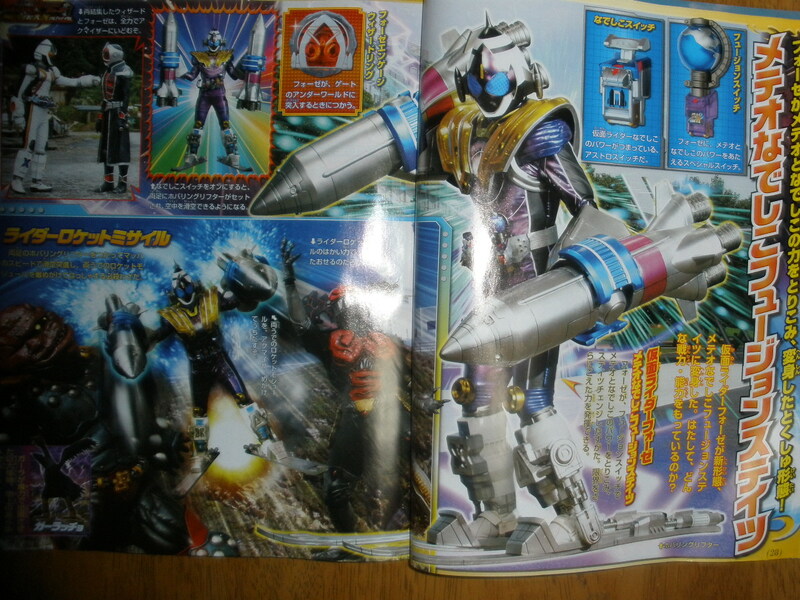 Also, the big bad decides to reveal himself in his true colors. 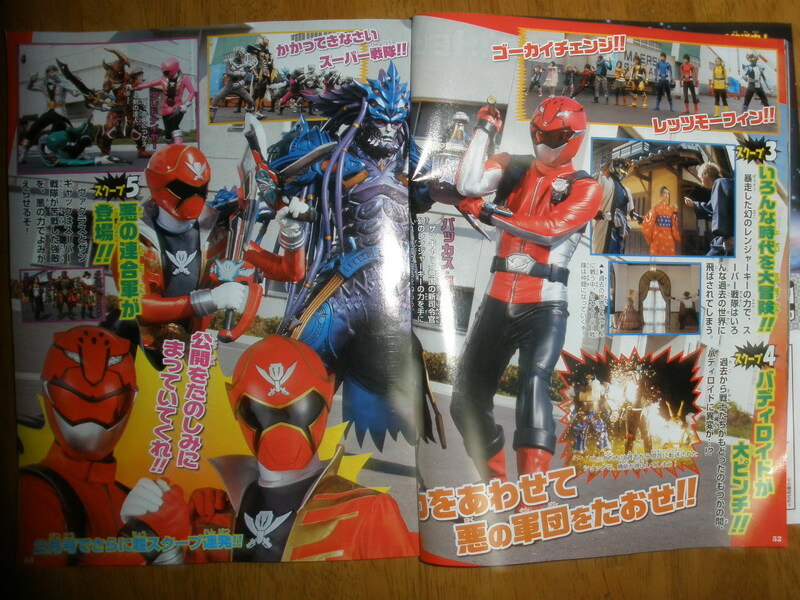 The weird, Radiege-looking dude is the true form of Wiseman. 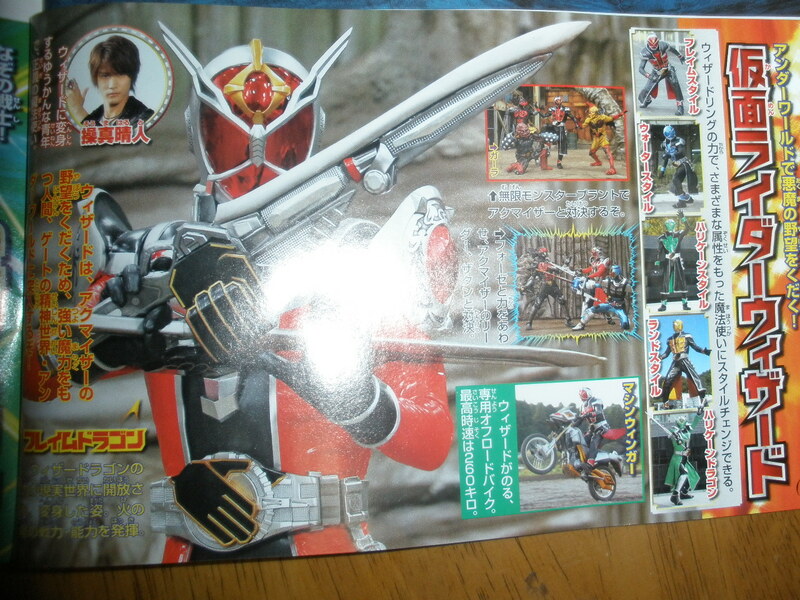 What his plans are...only time will tell. A look at the older heroes who will get a reboot in Movie Wars Ultimatum (some as allies, others as villains.) Also, and RC Machine Winger. 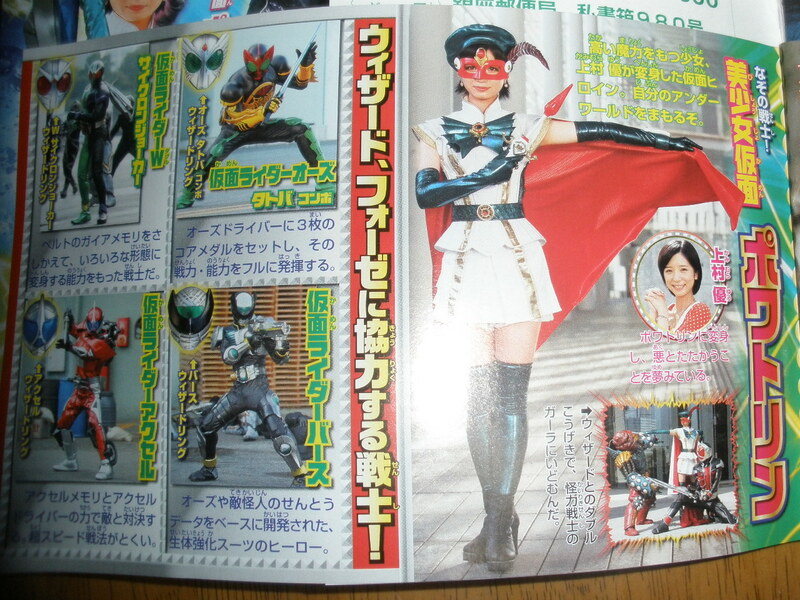 Cool beans. 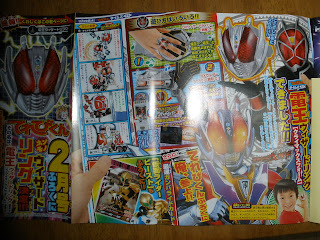 A Den-O Climax Form ring, and a DCD Card for Beast. 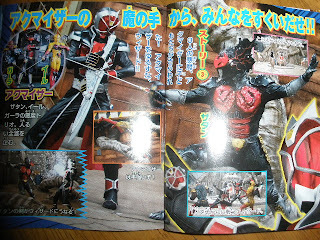 The second rider makes his debut- Beast, holding his Dice Sabre. Haruto will get a bunch of new rings in the movie. Time (time travel, it seems), Fall (something to do with the Underworld I imagine), Special Rouse (not sure on the spelling, but it likely activates All Dragon, if only for the movie.) 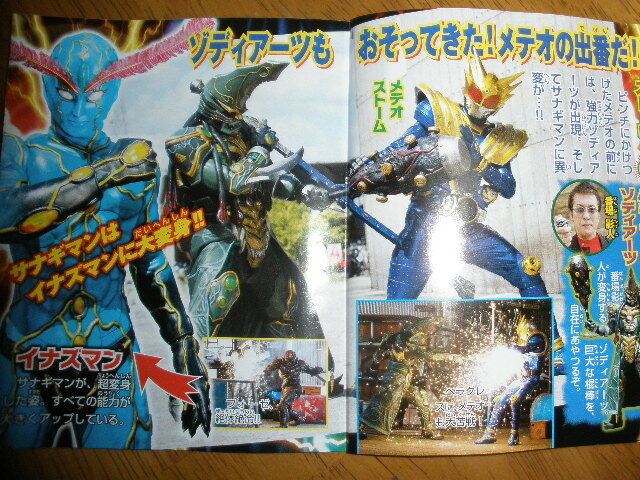 Also utilized are Wizard Rings of Birth, Accel, OOO and Double, which seem to call the afformentioned riders to him. 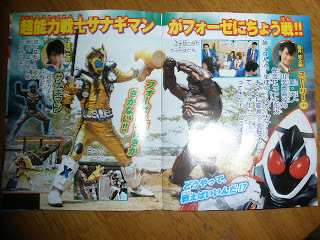 Sanagiman turning into the new Inazuman and taking on Hercules. Not sure where this Inazuman's allegences lie in the film, but here at least, it looks like he turns good. 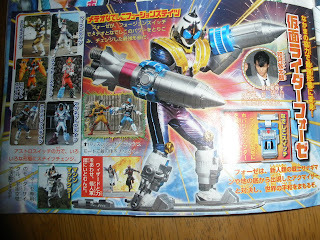 Fourze's new form, MeteorNadeshikoFusion States. 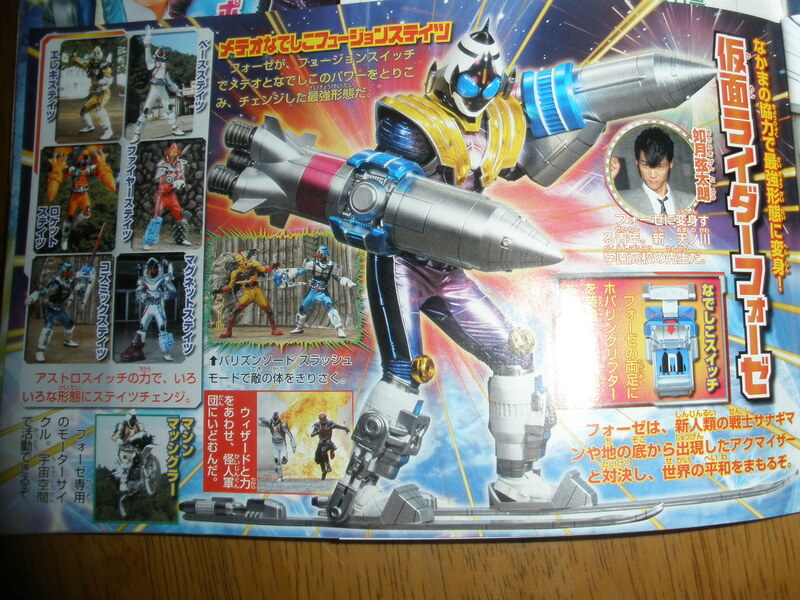 He achieves this form via the Nadeshiko Switch (what she was turned into in the previous Movie Wars, and the Fusion Switch.) 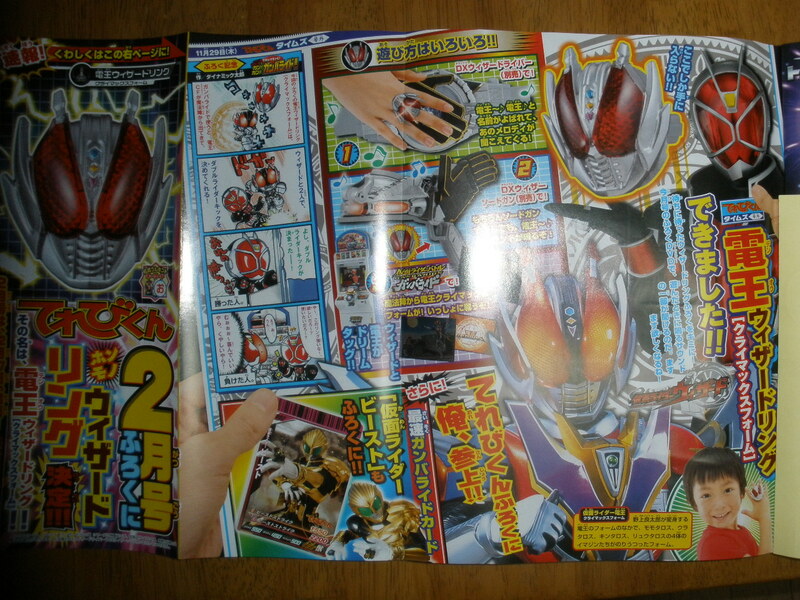 Haruto will use a special "Fourze Engage Ring" to bring Fourze into the Underworld. 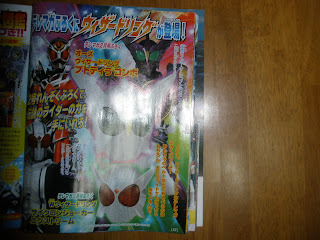 Rings of both Putotyrannosaurus and Cyclone Joker Xtreme will be released. 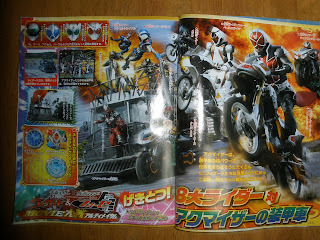 Sanagiman and Fourze going head to head. 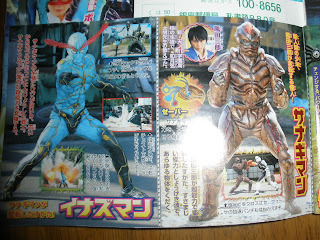 Inazuman, Meteor Storm VS Hercules. Wizard fights the Akumaizer 3. 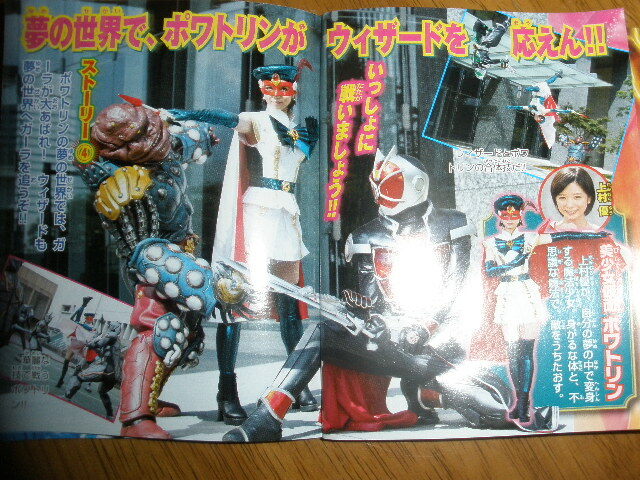 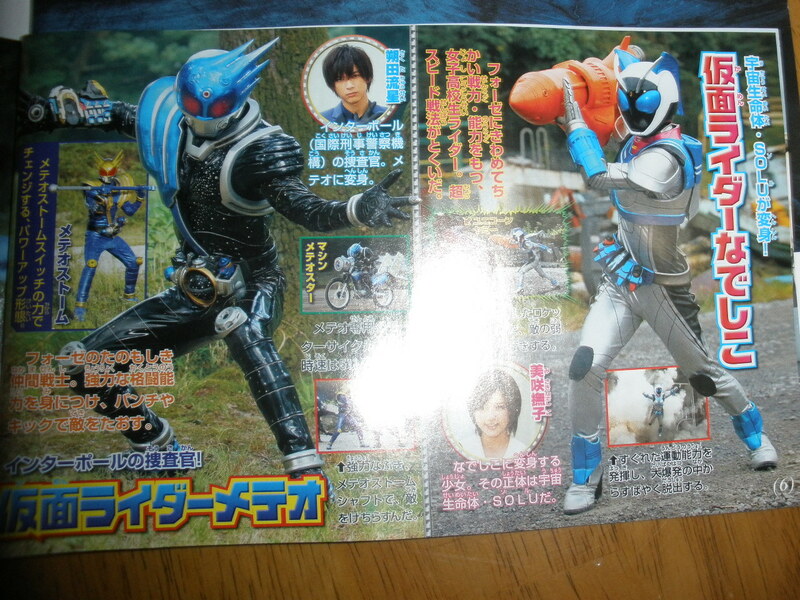 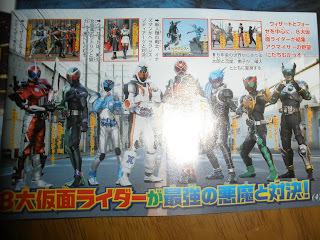 4 Riders (Wizard, Fourze, Meteor and Nadeshiko) team up! 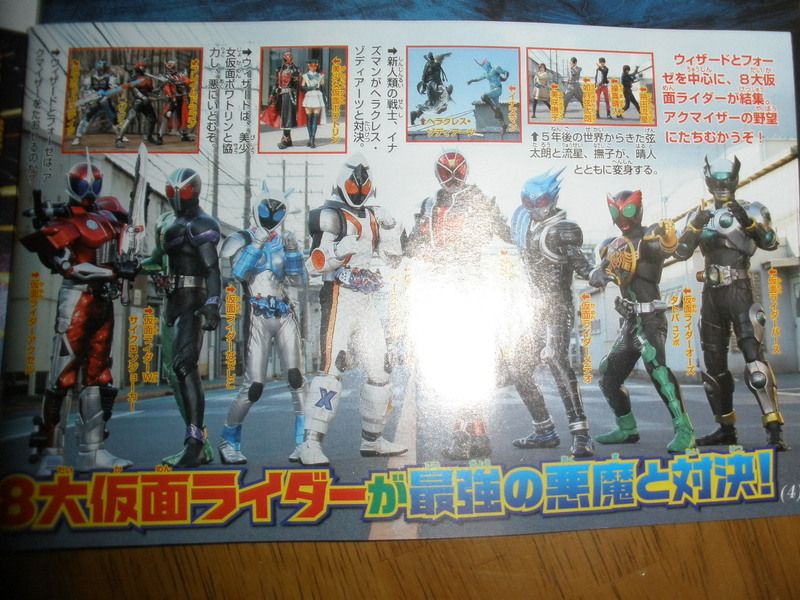 W, Accel, OOO, and Birth join the fray to make an 8-rider team! 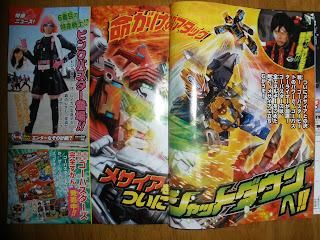 Fourze Cosmic States and Flame Dragon fight the Akumaizer in a final battle! 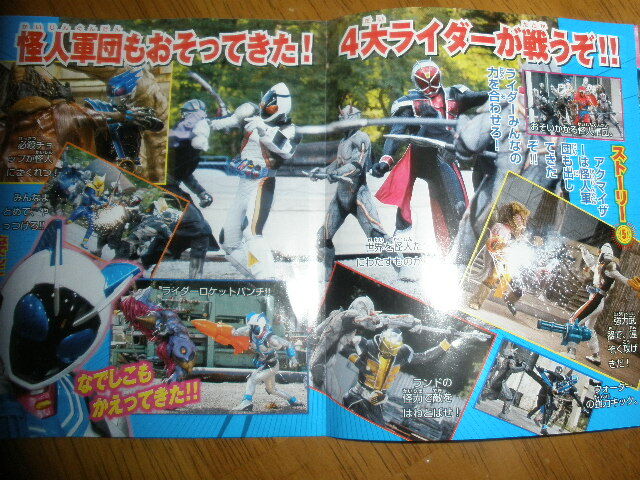 More MeteorNadeshikoFusion States, other Fourze States. 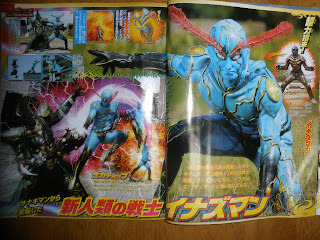 Inazuman and his former form, Sanagiman. 4 vet riders and Poitrine. 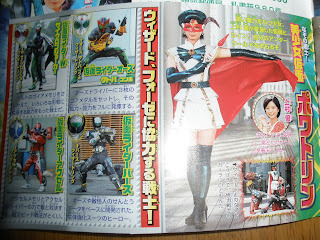 Pink Buster, is the transformed identity of the mysterious Phantom-Thief, Reika! 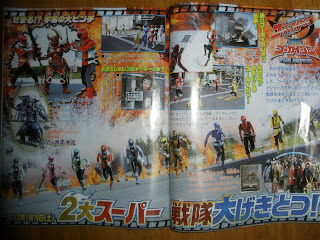 Nikku joins Hiromu in the cockpit of Go-BusterRaiOh, as it and BusterBeet team up against Messiah Reboot. 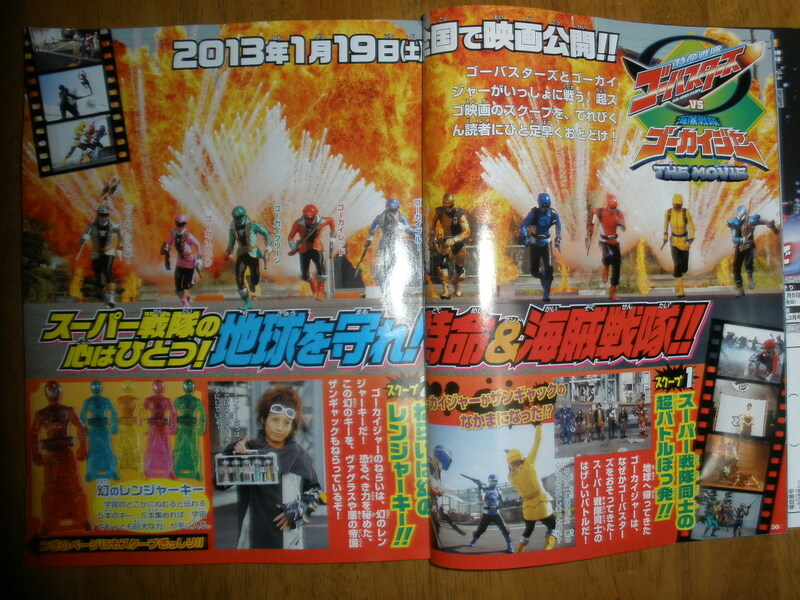 The teams collide on January 19th. 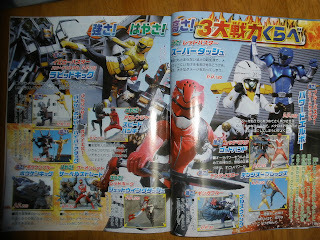 Key to the film are the Gen no Ranger Keys (Phantom Ranger Keys.) 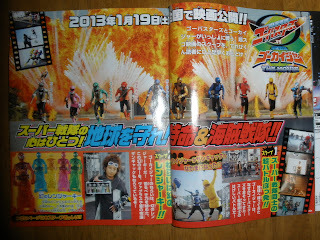 The Go-Busters take on the Gokaiger, who return to Earth as villains. 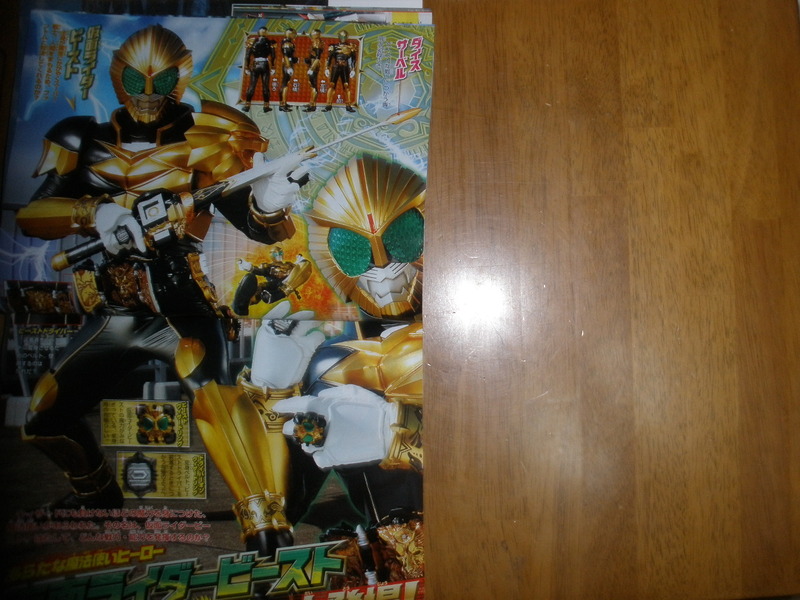 The Gokaiger were after the Phantom Keys, which hold a Great Power bigger than the Universe. 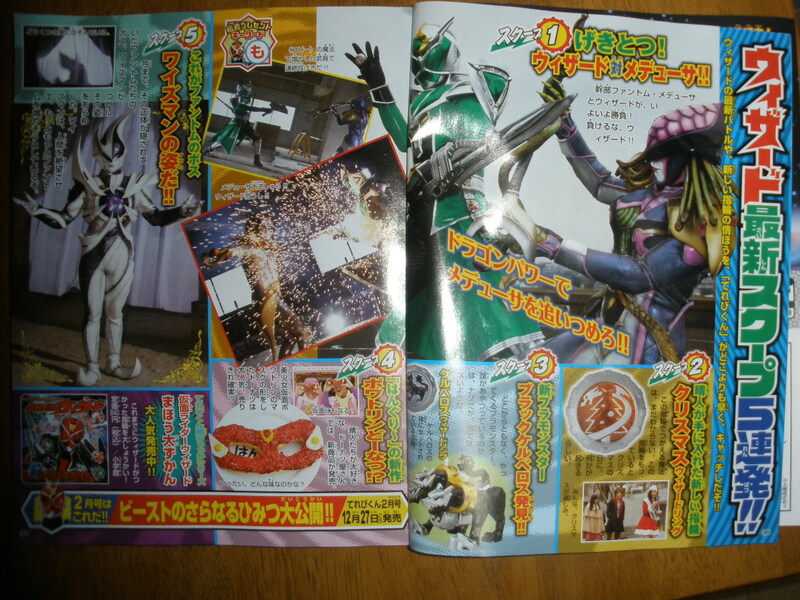 Vagrass and Zangyack also set their aims on these Keys, and it looks like Enter has them. 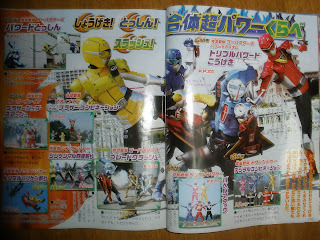 Some past Super Sentai may show up- looks like Kaoru is gonna be there at least. 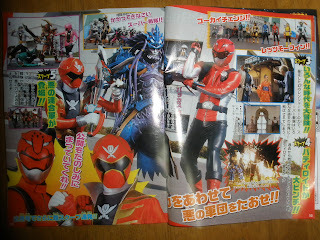 As you should assume, the Gokaiger won't stay evil. 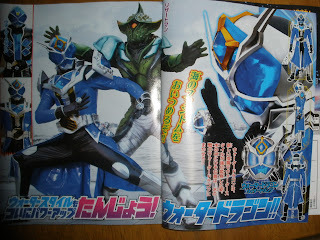 Hiromu and Marvelous team up against Bacchus Gil, the new head of Zangyack. 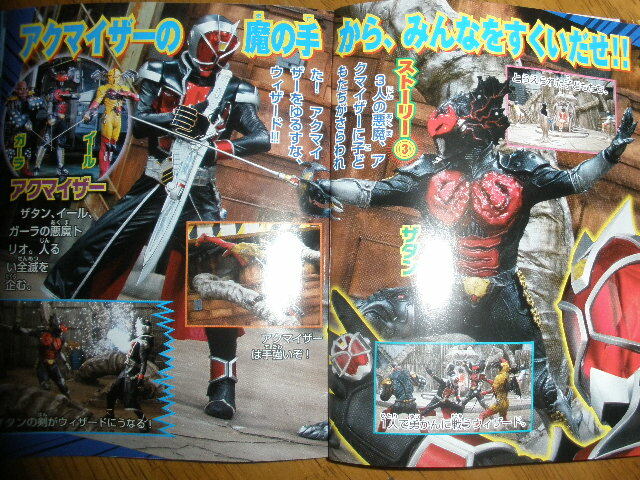 Don, Aihm and Gai take on Uredonaiya, his right hand man. Basco and Damaras reappear in the film alngside Escape, and the Buddyroids face great peril. 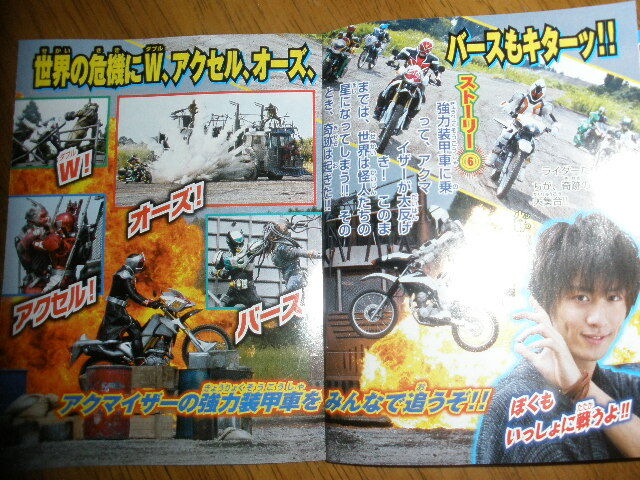 Gai seems to be time traveling a bit. 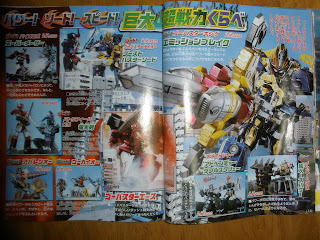 More comparisons, this time with Robos. 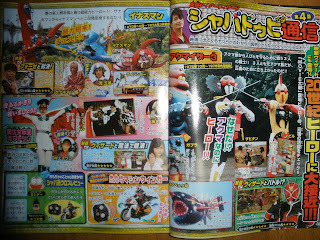 2 teams fight, a Black GokaiGalleon, Navi in a cage, and the fate of the universe on the line. 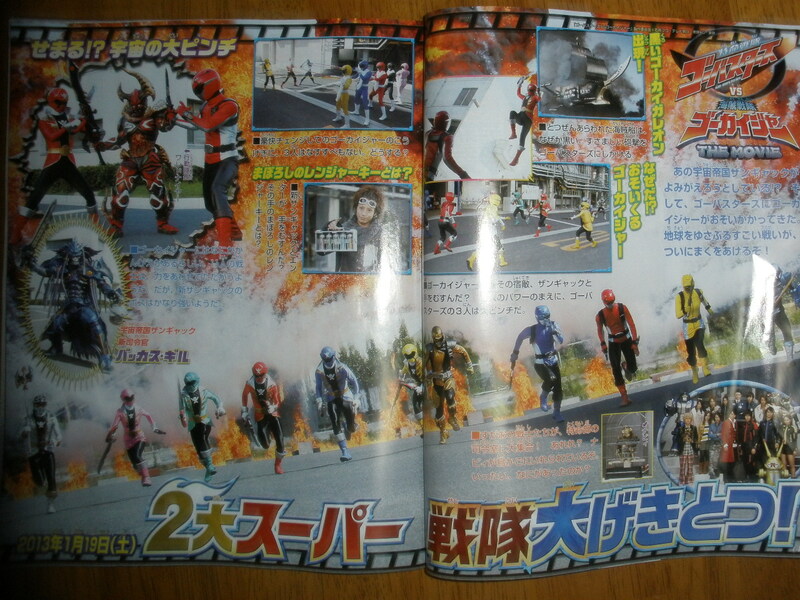 Just another day for the heroes.